Okay, so I just lied to you. I’d forgotten about the weekend that Cathy and I used her pizza-making skills (one of the reasons I married her, folks) to lure Gerry Shamray over for an evening during which we spread eight weeks of the teen pregnancy story line across the living room floor, and, with a great deal of back-and-forthing and pizza dribbling, selected the four weeks that I eventually used. Not strictly a gag session per se, but more like a soft-rollout-beta test. Just thought I should mention that for the record. Now all that remained was to convince the syndicate that we could run with this story and that the world wouldn’t come to an end, at least I was pretty sure it wouldn’t. At Rick Newcombe’s invitation, I flew out to California to personally make my case for the story. I knew that this work was something different and I didn’t want to sandbag an editor by simply allowing it to show up in the mail unannounced. To his credit, Rick, who had a lot on his plate at that particular moment and who may have had some personal reservations about what sort of reaction we would receive, had my back the whole way. Rather than the typical “no, we don’t dare do that because someone might write a letter to the editor of the paper and complain” syndicate reaction, Rick made some suggestions that strengthened the piece, which I happily incorporated. Ironically, just as I had acquired editorial control, I found someone who could work side by side with me to make the strip better. 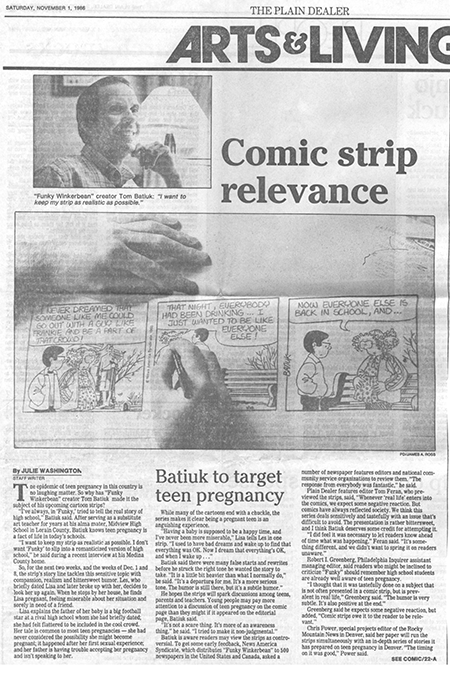 The syndicate also created a lot of sidebar material that editors of newspapers on Funky’s client list could use in conjunction with the strip to inform readers and to create a discussion around the issue of teen pregnancy. In essence, the problem of putting this story before the readers was flipped on its head and it was used instead to present a teachable and reachable moment. Rather than saying that work like this didn’t belong on the comics page, the syndicate said let’s use the comics page to shine a light on this problem, to start a discussion. And it worked, but at first it almost didn’t.